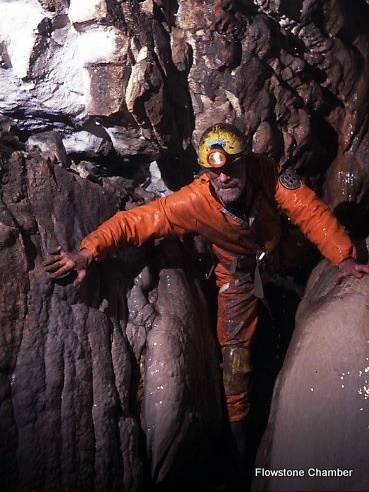 The trade route down Bar Pot is one of the best known in the Dales, and without doubt is the most frequented way into the Gaping Gill System. It's fast, straightforward, and with rigging doesn't take more than half an hour to reach the bottom. The route described here is a lot slower and more esoteric. Nevertheless, it's an important route, both geomorphologically and historically, and it is a good introduction to the less well-known parts of the Bar Pot System. Moreover, apart from crossing the traditional route in Bar Pot in one place, it also provides a totally different way of reaching South East Passage. It is probably not, however, suited to those who prefer their caving to be more dangle than substance. When the entrance to Bar Pot was opened up in 1949 the routes to the Big Pitch from Bridge Hall were initially unknown, and the original way was to crawl through the bedding plane above the Greasy Slab into a parallel system which led via a couple of climbs and a pitch into Whitehall - an impressive rift passage which emerges at the back of the Big Pitch. Upstream, the parallel system was found in 1976 to end in a chamber, Small Mammal House, which was subsequently linked to the surface through Small Mammal Pot in 2005 (project log), and Stile Pot in 2008 (project log). The first part of the route follows this parallel system to the Big Pitch, and then makes a descent of the very fine South East Aven. The entrance to Small Mammal Pot may be found in a patch of clints, five metres south-east of the start of the standard descent in the Bar Pot shakehole. A short drop and a slide over a boulder enters a rift passage, which leads directly to the top of the 20 m pitch (rigging guide) into Small Mammal House (photo). Small Mammal House was originally named after piles of bones from assorted small mammals that littered the floor, but these were buried by digging debris falling from above. The way on is through an obvious muddy crawl a couple of metres from the rope, into a boulder-strewn descending passage. 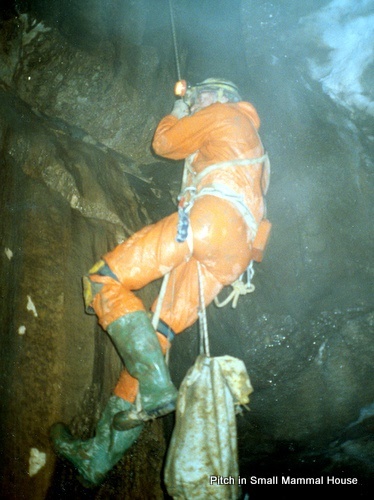 After a few metres the passage ahead drops down a steep boulder slope, at the top of which a passage to the right drops into the attractive Flowstone Chamber (photo). In the floor of the chamber, a tight rift leads onto a pitch which we will soon be descending. Initially, however, our way, however, is to climb up over the rift, into a low bedding. Immediately after a constriction, keeping to the right wall leads to a wide rift in the floor. We are now on the original descent route of Bar Pot. From here to the Big Pitch, spare a thought for the original explorers dragging their rope ladders, as you slide through with your streamlined rope bags. The rift is about 3 m deep, and can be easily free-climbed. At the bottom, an obscure but roomy hole under the near wall descends a steep ramp to a bedding overlooking a nicely sculpted 10 m shaft, with a thin rift straight ahead leading back to Flowstone Chamber. At the base of the shaft is a feet-first clamber over an upright boulder to a 3 m drop into a section of rift passage. Immediately to the right, another pit may be reached through a bedding. Our way, however, continues through the small rift into a flat-out section. This doesn't last long, and after a couple of minutes a long, high rift chamber is entered. This is Whitehall, and it is probably the most impressive section of passage in Bar Pot. Past a couple of descents, the rift chamber ends in a bedding area, on two levels. Keeping to the upper level and turning left enters a short section of passage which soon drops onto the broad boulder-strewn platform at the back of the Big Pitch. A standard descent could now be made of the Big Pitch, but keeping to the brief of seeing parts of the system not often visited, our route follows a protected traverse along a ledge round the left of the shaft to reach an obscure keyhole passage which goes off alongside the far wall. This is a little constricted at first, but soon opens out. The short length of passage ends in another shaft. Straight on, an inlet cascades steeply into the shaft. To the half right, the rift continues round the corner. Separating the two is a buttress the top of which forms a ledge a couple of metres below the lip of the shaft. This set of passages is located at the top of South-East Aven. A Y-hang from the roof, best approached by traversing out from the small drop three or four metres back up the passage, drops you onto the top of the buttress. From here, make your way onto the chockstone platform behind it, and traverse up over the continuing deep rift to regain roof level. A couple of bolts will then be found on the far side of a jammed boulder which provide a Y-hang for a superb free-hanging descent down the centre of the 28 m shaft, which is considerably more impressive than its neighbour, Bar Pot Big Pitch. It lands adjacent to the entrance of New Hensler's Passage. This is by no means the easiest, or cleanest way down Bar Pot. It is, however, more fun and more challenging than the trade route, and provides a fresh insight into the complexities of this classic Yorkshire system. Page last updated: Sunday 27 January 2019 .